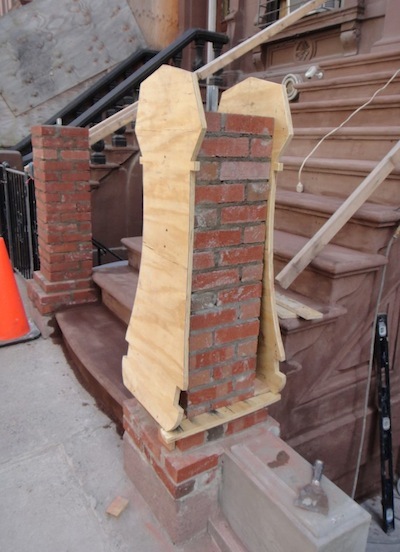 We were going to have a sub-contractor do the work, but one company wanted to charge $53,000 (just for the stoop), and the other one kept missing and being seriously late for meetings (not a good sign on a critical path task). So our contractor is having his guys do the work. That was filled in with concrete to form a new edge. 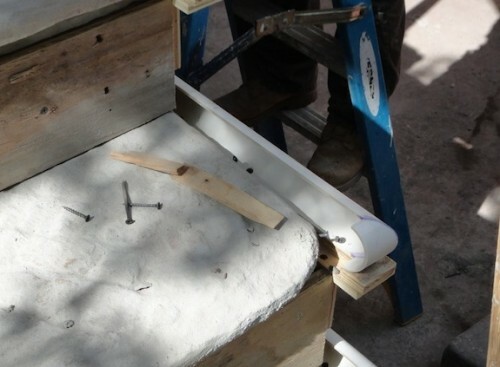 When they did the front they embedded wire in the concrete to reinforce the leading edge of the step. 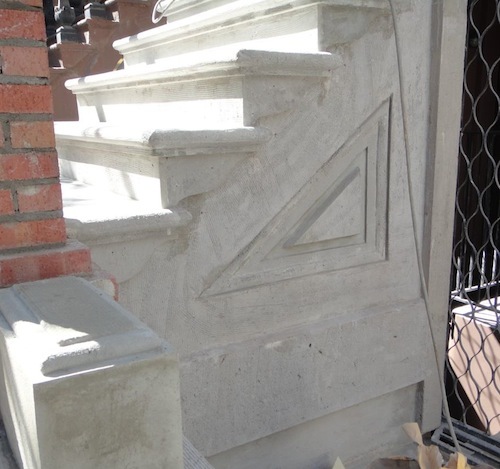 You can also see how they’ve recreated the triangular detail on the side of the stoop. 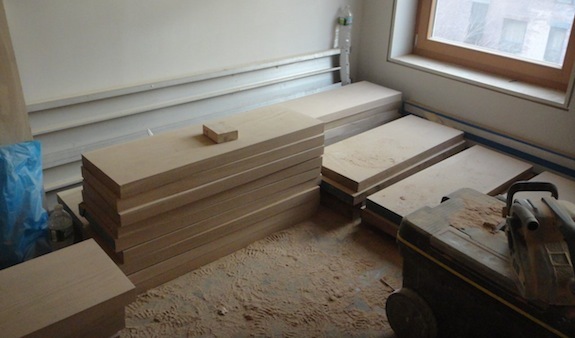 It was a multi-stage process – you can see the picture below has more detail in the design than the one above. In the picture above everything is ready for the final “brownstone” finish coat. All the concrete work has a very coarse finish to it that’s not quite visible in the picture. You can also see that they’ve recreated the low walls that were there originally. Simultaneously to that another worker has been grinding all the rust off the original ballusters (and the ones we bought at Demolition Depot to fill in what we were missing), but that’s the subject of another blog post. We had a hard time figuring out what to do with the newel posts. A building on 122 was willing to sell us their newel post and railing, but the price was high, and it didn’t give us everything we needed and it was only one newel post and one section of straight railing (plus a bunch of ballusters we didn’t need). 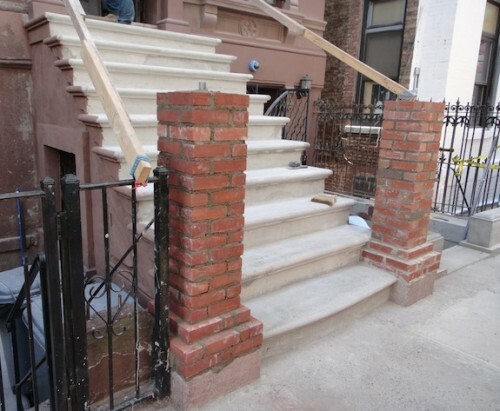 In the end we decided to do masonry newel posts since it was less expensive, quicker, and what the National Park Service has approved (though we made a few changes to the approved design). That’s where we stand as of today. 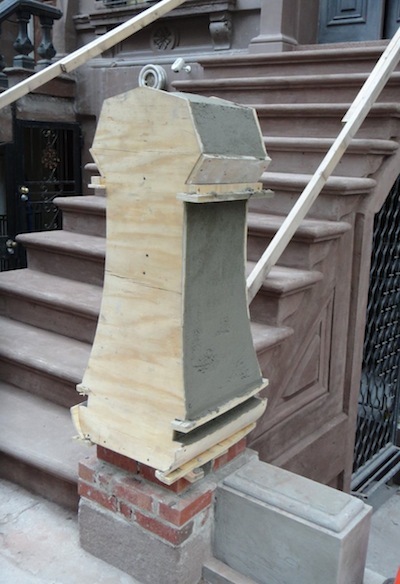 Tomorrow they’ll take off the forms, do the other sides and repeat the process with the other newel post. The house wall is painted, the retaining wall has the “brownstone” finish. 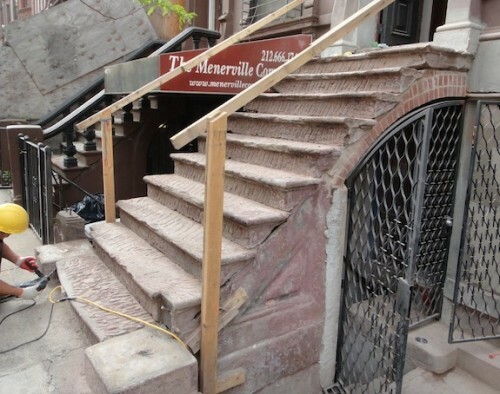 It’s not the same quality as the $10M townhouses you see on the Upper West Side, but it’s better and hopefully more durable than a lot of what we see around Harlem. It doesn’t look like brown sandpaper. It looks better than brown stucco, but almost has a paint-like quality to it – though it has more of a texture than paint. 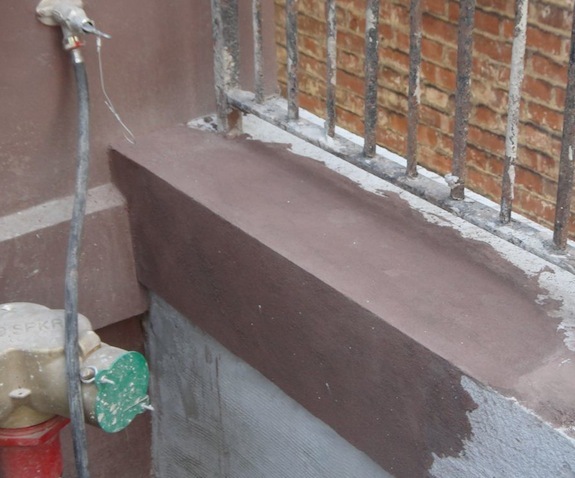 One thing I should mention is that we’re not refinishing the under side of the stoop because if water gets through the new finish on the top, it needs to be able to go through the stone and get out. So we’re getting there… I just want them to be done though… But soon enough they will be done. 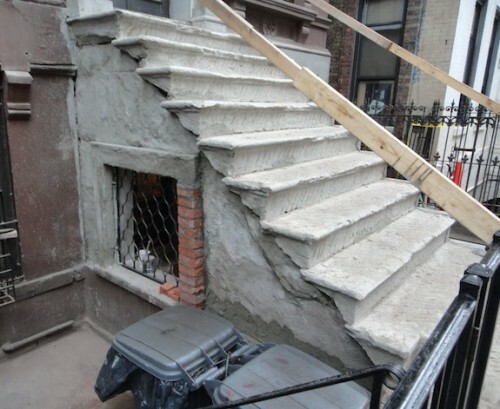 Today the contractor discovered that the stairs aren’t square. 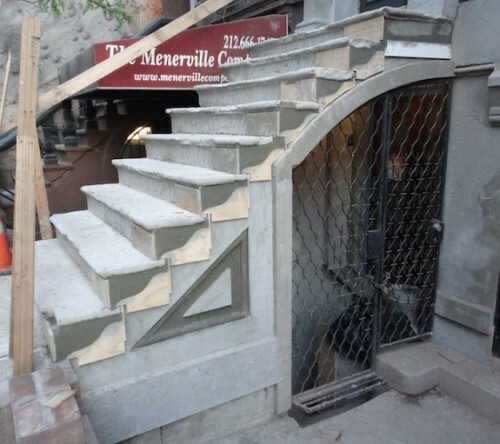 Blame it on the foreman he had on the project initially, or blame it on the guy who fabricated the stairs, or blame it on the contractor himself for not double checking things – but the end result is that the stairs are pretty obviously out of square. So that means they have to make things that aren’t square appear to be square – which is more difficult than it should be, but the guy working on it is up to the task. 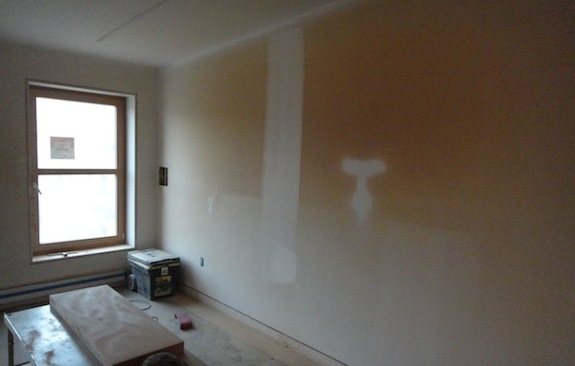 I’m pretty sure that’s just primer – so they’ll have to come back in and do it all again with the final coat of white. 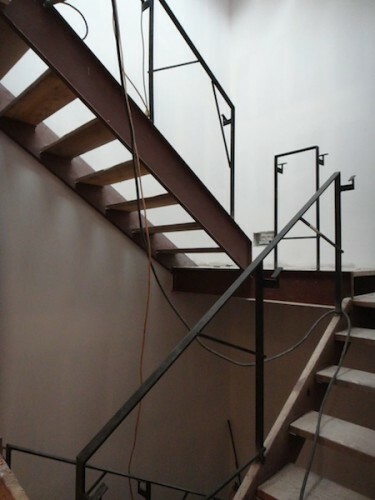 All the steel will be painted white, and there will be milk white plexi panels mounted on those frames and wood handrails. The railings are a bit shaky because they’re so thin. We’re hoping the plexi and handrails will stiffen things up a bit. One of my favorite features in the house is the laundry chute from the master bedroom into the laundry room. 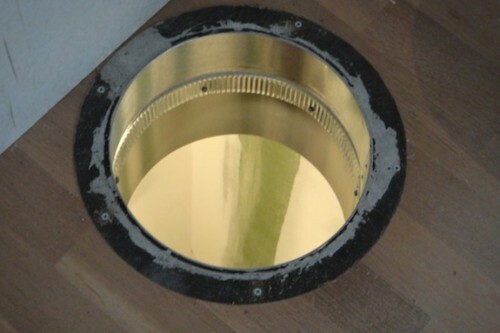 It’s funny to find a hole in the floor exciting, but it’s pretty cool (as is the whole concept of a laundry room – I’ve never had in-unit laundry before). We’re not sure whether we like those lights or not – they were inexpensive – we’ll change them later if we decide we want something better. We like how minimal they are – the big part of the lens is just a little bigger than a quarter – so it’s pretty tiny. 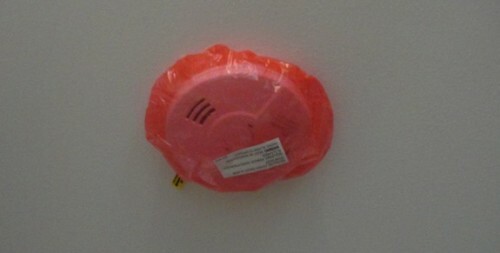 The thing I’m not looking forward to is that NYC code requires all the smoke detectors to go off when one of them goes off. When Dan burns something on the stove it’s going to be LOUD. But on the good side, they’re all hardwired – so no dead batteries to worry about. 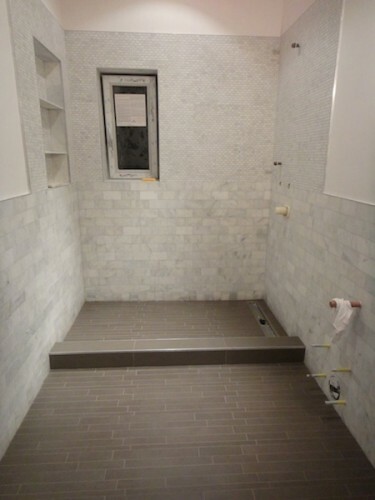 That took one of the workers 3 weeks to tile… The guy is slow, but he’s an absolute perfectionist so it’s flawless when you look at it close up. 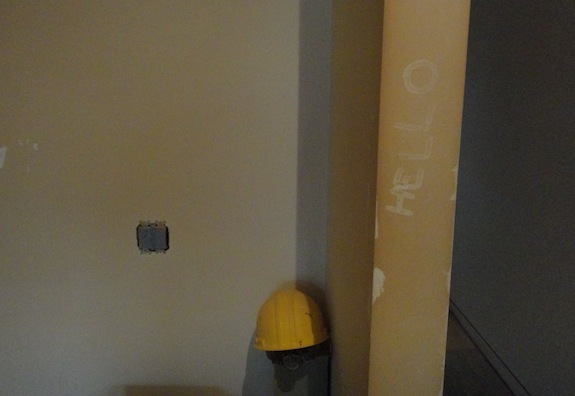 The same guy is now skim coating some of the walls (like the walls in the bathroom above). Hopefully in the next week some of the plumbing fixtures will start getting installed and there will be a big push on painting and finishing up the floors. Today we went to Ikea to buy closets, but when we got there we hated them. They’re not nearly as well made as Ikea’s kitchens. The closet solutions at Container Store are about 50% more – so we’re not sure what we’ll do – maybe just have the contractor make what we originally planned. 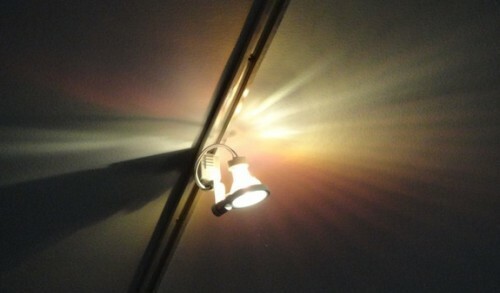 The insane bureaucracy at the Department of Buildings is causing us huge problems, AGAIN. 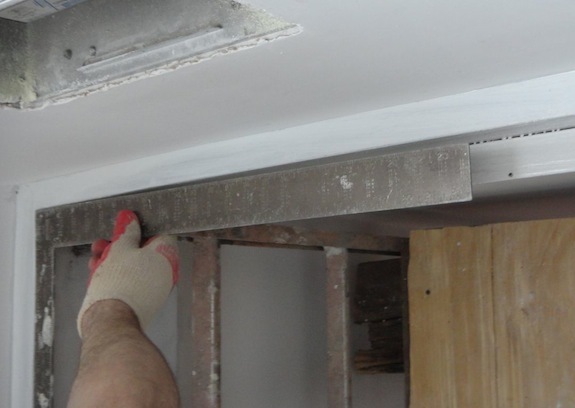 Near the end of every job there are a host of little things that have to be corrected on the filed plans so when the final inspection happens, what the inspector sees matches what’s on the plans. The most critical issue in our case is that the sizing of the gas pipes wasn’t specified in the original plans, and the plumbing inspector won’t sign off on the work until they’re shown. Without his sign off we can’t get our “blue card” and without the blue card we can’t get gas service and without gas service we have no heat. Without heat we can’t really put water throughout the building for fear of frozen pipes. But pipe sizing is just one of many issues that need to be corrected on the plans – there’s a bunch of other stuff – none of which is major. The problem is 1D with 1 hour fire protection isn’t what we’re doing – that would require all floors/ceilings and significant walls to have a 1 hour fire rating – the job should never have been filed that way. The plans clearly show that only certain parts of the building will have 1 hour fire rating – between the units, around the boiler room and the stairwell in our unit. The architect and expediter got it wrong, I didn’t notice it, and the original plan examiner missed it. But it makes a difference. Apparently construction classification is something FDNY relies on when they go to fight a fire. They don’t send fire fighters in after a certain amount of time unless they know the building will be safe. The problem compounds itself since certain things that are allowed in fire rated construction aren’t allowed in non-fireproof buildings. For example closets and storage spaces under egress stairs aren’t allowed since a fire could start in the closet. So now we have to go back and pick the best/correct classification, and then see if there’s anything we’ve built that doesn’t comply with that classification. It’s fortunate at this point that we’re “fully sprinklered”, but my worry is that additional sprinkler heads might be required since “fully sprinklered” means different things depending on the situation. 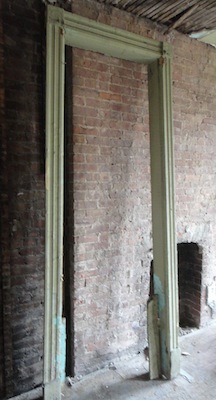 For example our power room on the parlor floor is under the stairs. Will it now need to be sprinklered? Unfortunately, you can’t get individual sheets approved. In our case we need the gas riser diagram approved, but all the other things are holding it up. On a larger project you’d file the plumbing as a separate job so you could do narrower PAAs, but that generally isn’t cost effective in project our size. If we could just get that one sheet signed off, things wouldn’t be so dire right now. The bottom line when we left the plan exam was that, unless we do something drastic, it will probably take months of appointments to get the PAA approved. The new plan examiner is just going to keep finding one thing after another and draw out the process as long as possible – all things that have been signed off on in the past. We don’t have months to complete the project. We need gas, we need heat, and we need to move in so we can stop paying rent and storage fees on top of mortgage. 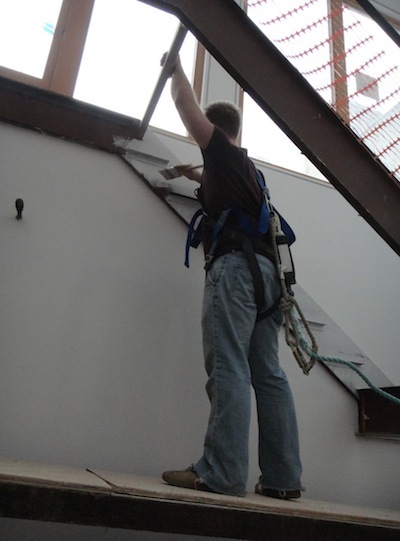 Our architect has worked on some really large, big budget projects and as a result knows expediters with decades of experience who have a much easier time getting things through DOB. We’re hiring one of those people to do code review and take over expediting. It’s going to cost us pretty big money, but delays and problems could potentially cost us even more. When we have our next plan exam, I’m hoping the plan examiner will know and trust our new expediter and when the plan examiner does bring up issues I hope our new expediter will show he knows the code as well or better than the plan examiner. And if competence and experience aren’t enough, after decades of working with DOB, I’m guessing the new plan examiner will be friends with enough senior people at DOB that the plan examiner will know that just being arbitrarily difficult could backfire on him. I was thinking ConEd was worse than the DOB. Now I’m back to thinking DOB is worse. I’ll just be happy when things are signed off and we can move in. Demolition Depot is giving our friends a small store credit with which they hope to buy an “original” front door. Mind you, to actually use whats being rescued you’d need to strip 100 years of lead-based paint – so there’s a reason why the store credit isn’t all that large. 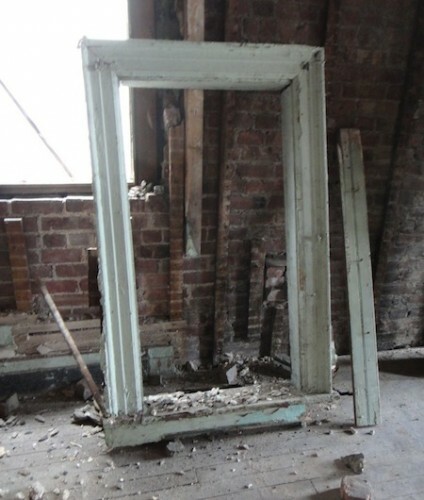 Below is one of the window frames Demolition Depot took out. It’s not all that special (I wonder why they wanted it), but some of the woodwork on the parlor floor was pretty cool and more interesting. 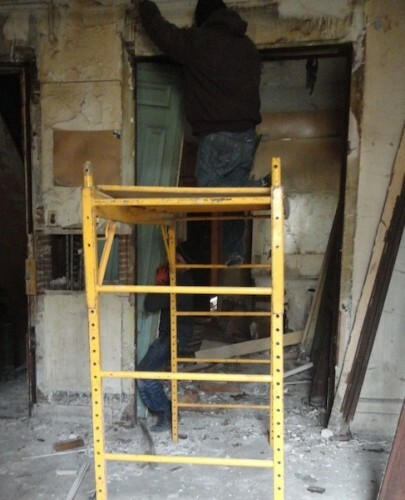 So if you’re doing demolition, don’t just throw everything in a dumpster – if you let a salvage yard rescue what details you have left, it may come in really handy to one of your neighbors. 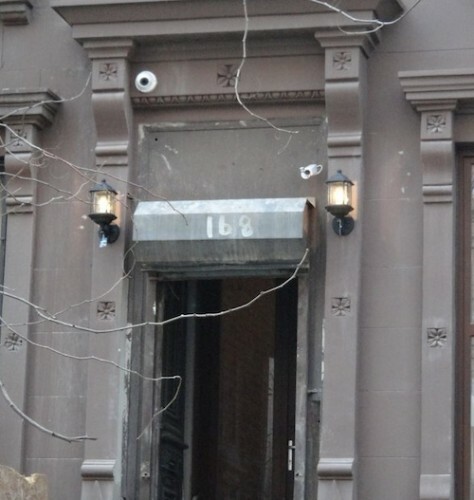 For example we got our front doors from Demolition Depot, and we’ll probably get a bunch of stoop ironwork from them as well.